Since 1999, when economist Paul Krugman started writing for The New York Times, he has been drawing the criticism of free market-oriented economists (and recently the president of Estonia) for glaring deficiencies in economic analysis and for writing what amounts to “fiction” (economist and Estonian expert Steve Hanke’s word to describe Krugman’s trashing of Estonia’s recent robust economic growth and counter Keynesian fiscal reforms). The Krugman-Estonia kerfuffle raises an interesting question: Has Krugman ever sided with free market economists against government activism in his Times forum? “Why should ever-increasing homeownership be a policy goal? How many people should own homes, anyway? 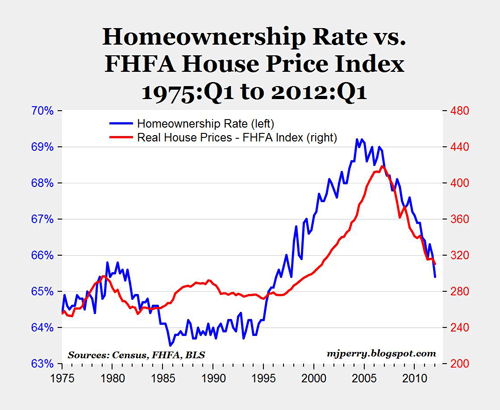 Listening to politicians, you’d think that every family should own its home—in fact, that you’re not a real American unless you’re a homeowner. . . . and that is reflected in U.S. policy (MP: Which drove homeownership to unsustainable levels and created the housing bubble, see chart above). Because the I.R.S. lets you deduct mortgage interest from your taxable income but doesn’t let you deduct rent, the federal tax system provides an enormous subsidy to owner-occupied housing. On top of that, government-sponsored enterprises — Fannie Mae, Freddie Mac and the Federal Home Loan Banks — provide cheap financing for home buyers; investors who want to provide rental housing are on their own. In effect, U.S. policy is based on the premise that everyone should be a homeowner. We can only hope Krugman will direct a future critical blast toward the Government National Mortgage Association (Ginnie Mae) for continuing to promote home ownership on its web site.